"I got my tattoo in Albuquerque although its origins can be found in Oklahoma, where I took my first job out of collage working for the now defunct Tulsa Tribune. I was making $13,000/year as a reporter covering public education. I rented a room in house with a view to the Sunoco refinery. I was in love with two men, the closest of whom lived almost 700 miles away. Tattoo shops were illegal in Oklahoma at the time, so a friend told me about a tattoo artist from Arizona who would fly into Tulsa and tattoo after hours in the beauty parlor where her mother worked. I picked out the design from a Mexican milagro, (literally 'miracle') a small metal charm usually in the shape of body part (eyes, lungs, arms) that could be pinned to the robe of a religious statue as offering. They were supposed to concretize the prayers of the faithful. A lung-shaped milagro, for example, might be pinned to the robe on a Virgin of Guadalupe statue along with prayers for the health of a family member with a cough. 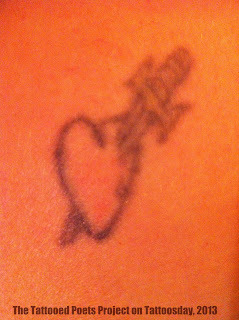 For my tattoo, I chose a milagro heart with a dagger through it that I thought was supposed to ward off a broken heart. We awaited the arrival of the tattoo artist from Arizona. And when he didn’t show, I drove with my friend to Albuquerque—and got my tattoo there—where I’d met one of the men I had fallen in love with. The one I would marry and with whom I’d move to Mexico City. The one I would divorce. I came back to the states, became a poet and started grad school, fell in and out of love a few more times. Early in an intense courtship with the poet Farid Matuk, we took photos of each other’s tattoos and started using them as screen savers on our cell phones. In the ten years since, we’ve moved in together, moved to Dallas, had a baby, got married in copula of a Marfa, Texas, courthouse, switched cell phones and numbers, but we still have the same tattoo photos as screen savers. A few month ago I figured out what my next tattoo will be (Farid already has his) a copy of the birthmark that our daughter has on the inner arch of her right foot." Farid's tattoo appeared earlier today on Tattoosday. thin legged ponies and miles for water. rain scrubs stone, halogen rusts the sky. who parts branches with a lover's rough fingers. a bed of lottery tickets or a fistful of keys. A bowl at the table. A parking space. A window full of shallow hills. Susan Briante is the author of Pioneers in the Study of Motion (2007) and Utopia Minus (2011) both published by Ahsahta Press. Her chapbook, The Market is a Parasite that Looks like a Nest, part of an on-going lyric investigation of the stock market, was recently published by Dancing Girl Press. She is an associate professor of literature and creative writing at the University of Texas at Dallas. She lives in east Dallas with the poet Farid Matuk. Thanks to Susan for sharing her tattoo and her poem with us here on the Tattooed Poets Project on Tattoosday!